I'm sorry that this program is getting day by day but this article is old. If you have any question or request about POCHi, you can ask me in comment, or Facebook, or Twitter. I will be glad to reply you. Hi. I updated the good tip for Mac user who have to use multi languages, 'Pochi' ver. 7.9. Now you can use input language shortcut in virtual PC as well as on Mac. So I have to switch these three languages so often to write articles in Japanese, and Korean, and also English. The language short cut on Mac OS is no longer exist now, so I searched the sipmle shortcut free application on internet. I found and tried some free application, but they never worked well and only bothered me. Then I reallized that when I use more than 3 languages, these shortcut apps dosen't work well on Mac OS. Karabiner is one of them. But I couln't bear to use annoying switching by [command+space]. I often push too much times, and then I have to push two more times again to switch to the language I want. 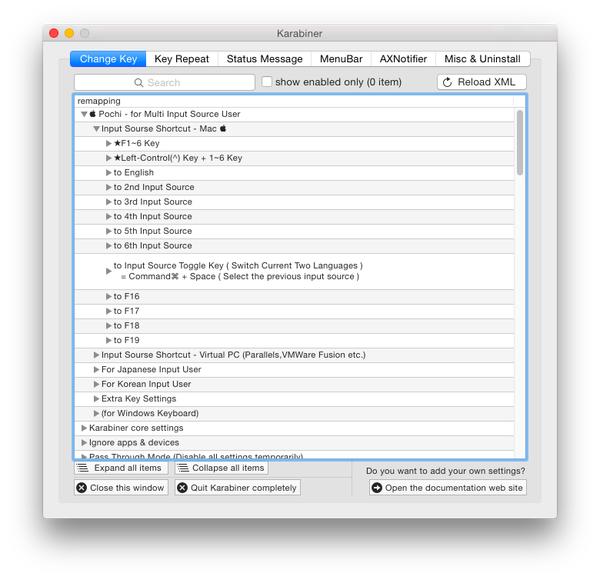 Then, the savior came out and saved me on the community about Karabiner(former KeyRemap4MacBook), an application for remapping keys on Mac OS. Then, it works! OMG! Wonderful! I made 27 45 types of shortcut key for switching 7 input sources at only one push, or double keys push. I will introduce the way to set this system, named "Pochi". And I was wondering if I can use the same setting in virtual PC like Parallels Desktop or VMWare Fusion, and I succesed to make the system on Karabiner, with the Windows IME short cut setting. 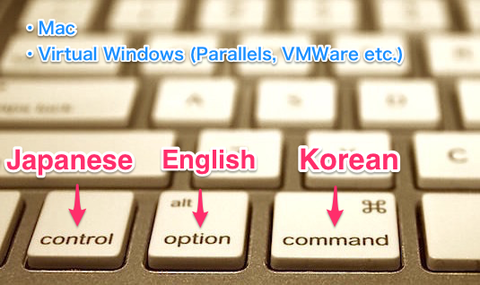 You don't need to push [command +space] or [shift+option] to change language in Mac and Virtual Windows PC any more. You can change until 6 languages(input source) at one push shortcut key. You can use English, French, German, Spanish, Portuguise, Russian, Japanese, Korean, Chinese, Thai, and every other languages, of course. Well, let's try to set the shortcut keys! 1. Well, you have to install the free application, "Karabiner" first. ↓ You can download and install here. 2. 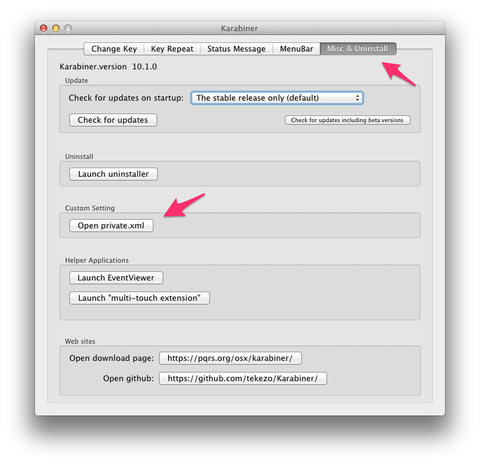 Then, launch the Karabiner app on Launchpad. Karabiner is very useful and excellent program for customising Mac keybord settings. At the first session, you have to open System Preferences and allow the apps in "Security & Privacy". 3. Click the tab "Misc&Uninstall" on the right side. Then click "Open private.xml" on the middle of this page. Then "Karabiner" folder will be opened and you can see "private.xml" file. in th folder. (If you don't have file extensions displayed, you will see the file name "privete". 4. Delete this "private.xml" file. 5. Then, download this file here and extract it. I sometimes add new function and update this tool. If you update POCHI, you only have to do like the way in 3.~6. and Reload XML. 6. New folder will be opend; name is "POCHI7". Move "pochi" folder and "private.xml" file to the "Karabiner" folder that you have opened already. 7. Then, Keyboard setting and select "shortcut" tab. And confirm that the shortcut key is set like this picure below. The second one has to be like this. If it is not, please click "Restore Defaults" butten, and check the check boxes. From El Capitan, Mac's default setting of Selecting Input Source has been changed to ⌃Space(Control + Space) and ⌥⌃Space(Option + Control + Space). 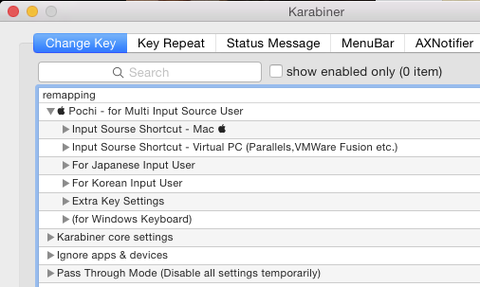 But Karabiner don't work on the setting. You have to change them like the picture above. And you have to notice that what the Spotlight's shortcut is. From Spotlight's shortcut default setting is also ⌃Space(Control + Space) and ⌥⌃Space(Option + Control + Space). You have to change them not to overlap with input source shortcuts. 8. Next, check the "Input Source" Tab. If there are any input source that you don't need, you should be better to delete it. 9. Then, let's return to the Karabiner. Select the tab "Change Key" on the left side. You will find the menu "Pochi -- Mac Input Source Shortcuts Arranger --" on the top of remapping lists like the picture above. Click it, and these menus will appear. "Input Source Shortcut - Mac "
"Input Sourse Shortcut - Virtual PC(Parallels,VMWare Fusion etc.)" New! "For Arabic Input User" New! "For Chinese Input User" New! "For Latin Symbols Input User" New! "For Vetnamese Input User" New! "For Extra Keyboard User" New! Click "Input Source Shortcut- Mac ", and shortcut settings will appear like below. The top 2 shortcut with ★ mark is for checking the order number of the language you want to use. and push Control + 1~7 key to change to 1st~7th input source. 11. Then, you know the number of the input source which you want to use. So at first, check the TEST check box. And push 1 key~7 key and confirm the numbers for each language which you want to use. You have to check the each number cherk box of shortcut setting in POCHI for each language. After you get the number of the language, don't forget to uncheck TEST check box. You can see the order of the Input sources to push the language icon which is on the upper-right corner in the Mac screen like below. English is always 1st input source, and 2nd, 3rd one continues below. 12. Then, Open the 1st(English)~6th input sources and check the shortcut that you want. For example, "Right-Command(⌘) Key" in "to 2nd input source" means "Push Right Command Key, and it turns to the second language." PC Application Key (※Windows Keyboard Only)　New! Control + Left Command New! Left-Shift + 英数(EISUU) (한자) New! Left-Shift + KANA(한/영) (한/영) New! Left-Control(^) + [ ; ] New! Backquote(`) (다른 와 같이 누르면 Command로 동작) New! F key & J key (Press both keys at the same time) New! (Press both keys at the same time) New! SPACE + かな(KANA) key (Press both keys at the same time) New! SPACE + 英数(EISUU) key (Press both keys at the same time) New! 英数(EISUU) + かな(KANA) key (Press both keys at the same time) New! 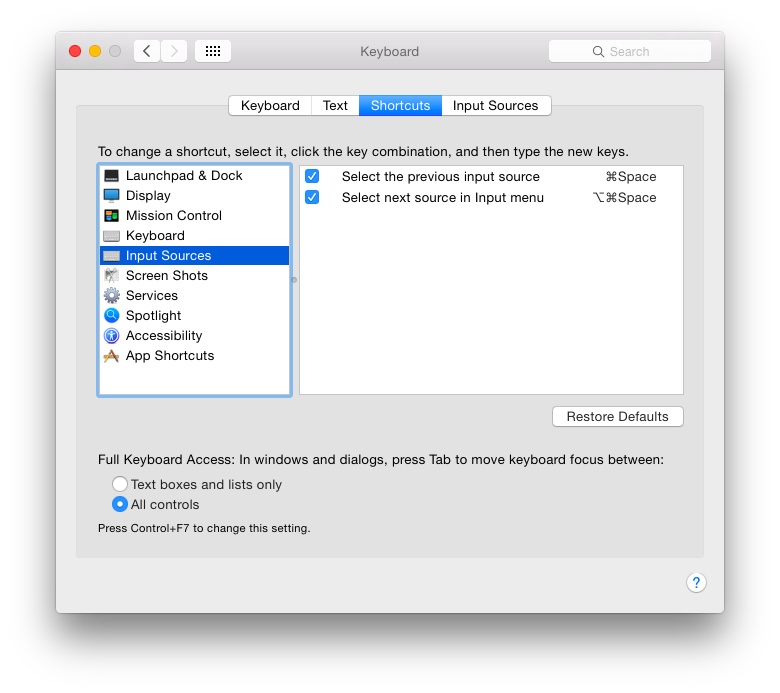 Left-Command(⌘) + Right-Command(⌘) (Press both keys at the same time) New! When you check the box you want, the setting will work right now on. You can set one input source to many shortscut keys, but you can use only one action by one shortcut key(※Upper one takes the priority ). So please check only one input sourch for each shortcuts. And you can use only 7 input sources. If you have more than 8 input sources, I recommend you to delete some languages like as KOTOERI, or change the sorting order of the languages in Language & Region in Synstem Preferences. I think simple and useful shortcut key is "Right-Command(⌘) Key"
You can use this key like KANA Key on the Japanese Keyboard. If you add one more language, "Right-Option", or "Left-Option" key will be fine. If you want to switch them faster, I recommend you to use "Left control(^) + i " or "Left control(^) + J, K, L". Because you can use these shortcut keys in home position. "F key & J key (Press both keys at the same time) " will also be easy to push. And I also strongly recommend you to change Caps Lock and Control by Mac OS setting. I use "Left control(^) + i " to change to Korean. It's possible to push in home position, very confortablly. To confirm the shortcut keys which you checked at once, check the box of "show enabled only" on the right side of "Search" textbox. 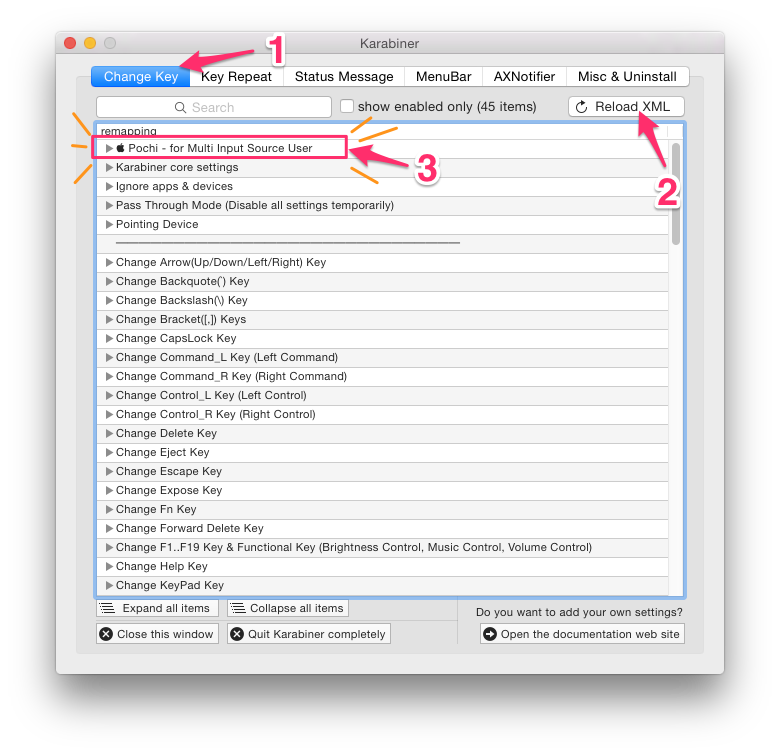 You can see all the shortcut setting that you are using in Karabiner now. For the setting of simultaneous keys(Press at the same time), you have to press 2 keys at once at the same time, not to press one by one. These are not shortcut for input sources, for the Function keys that you can use on IME settings or service shortcut settings on Mac. I use [SPACE + Kana Key] to F18 for convert to KATAKANA. And next, this is the new virsion that I made this time, the shortcut for virtual PC. You have to set the language shortcut on Windows OS. Open the "Regional and Language Option setting" in "Control Panel" and open the "Text Services and Input Languages". 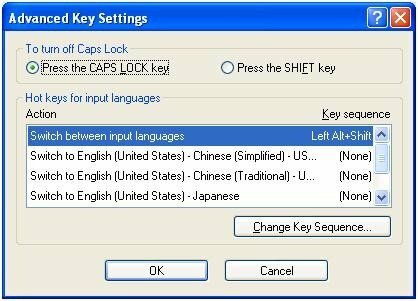 And you can set the each language key shortcut setting in "Advanced Key Setting". "Left Alt+Shift + 1~6 numbers." that you want to use. You'd better to use same numbers as on Mac ! 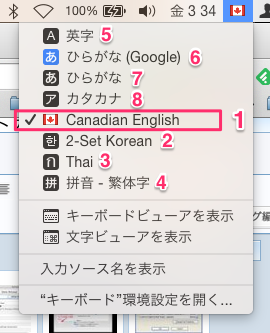 Then you can set shortcut keys for 1~6 Languages on POCHI like as on Mac. If you don't use English input Language now, I recommend you to install it. It will be more comfortable to change language. I made the settings for Jananese input user. You can change to Japanese input faster than "to ◯th input source". You'd be better to set shortcut here if you use Japanese. [1 key + 2 Key] to F19 (Mac/Virtual PC) New! This is a setting for sending F19 signal to change to KATAKANA, IME on/off, and so on. You can set it up in IME shortcut settings. More information is on this blog. This is the original settings for Korean input user. You can change to Korean input faster than "to ◯th input source". You'd be better to set shortcut here if you use Korean. This is helpful additional settings I want to use in some situation. ・Right-Command + "¥" Key ➔　"¥"
(Press both keys at the same time) ➔　Command+Z New! ➔　fn Key" are new shortcut I made at this update(ver.7.1). If you feel unconfortable to push "fn" key in Mac, please have a try. Push J & L at the same time, and it works as "fn" key. (I use this setting to call Karabiner by "fn + K", and to call Karabiner setting list by "fn + 1~4". "Switch current setting profile by fn+1,fn+2,fn+3, and fn+4"
( Open EventViewer by fn+E.)" Using Control + T, R, you can easily switch applications with your hands on the home potision. It may be confortable. If you have any quetsions or request about POCHI, feel free to send me masssage any time. #1. For Pochi, you can only use 6 input sources. If you want to use Kotoeri, I recommend you to remove Katakana, Romaji, etc. withtout Hiragana. But I recomment you to use Google IME or ATOK if you use Japanese. #2. If you had used Karabiber or KeyRemap4MacBook before, you may could have used original settings on "private.xml." So please open "private.xml" once and check the contents. If there are many articles there more than 4 lines, you have used it by your original setting. Then, back up "private.xml" and open it. and paste this texts next to in "private.xml", and save it. 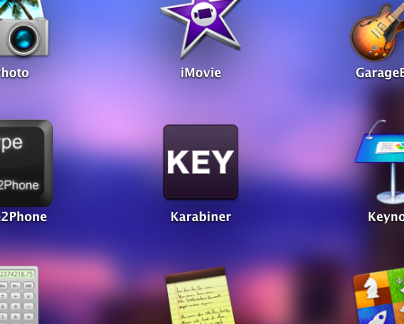 And move "Pochi" folder only to "Karabiner" folder. Then, click Reload XML, and you can use both original settings. If there are only 3 lines in "private.xml", just delete the file and go to 6. #3. If you use more than 3 input sources, you can't use toggle key on Mac. So you will be better to set shortcut by Pochi. #4. When you inport new language, it may not work at the firts time. Please press [command+space ] several times. And then Pochi will work well to change the source. #5. If you choose [Command_L(⌘) + Space], you can not select input source by Command_L(⌘) + Space as usual (the name of input source appearing on the center of monitor). But you can select input source by Option+Command+Space. (the name of input source doesn't appear on the center of monitor. You have to watch the small flag mark). And you can change the shortcut key in Sinsem Preference > Keyboard > Shortcuts. If you rewrite the code, you can also add new input source or more shortcut keys. And if you have any question or request about POCHi, you can ask me in comment, or Facebook, or Twitter.